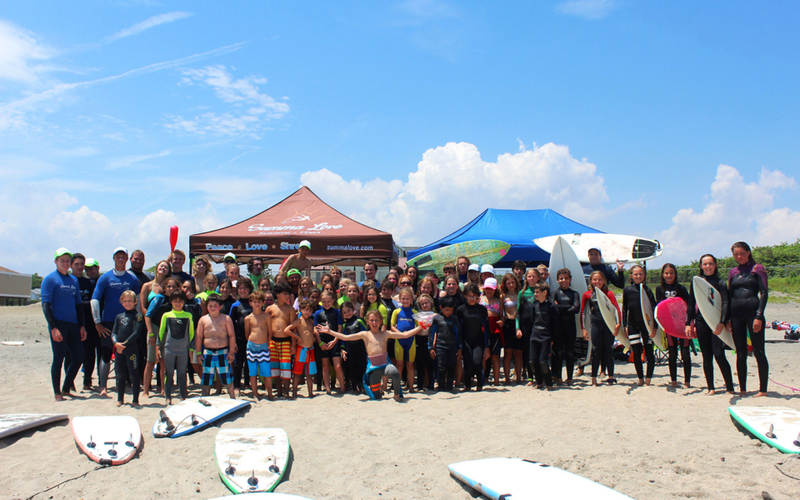 Summa Love Surf Camp follows the guidelines of the National Surf Schools and Instructors Association along with being accredited through the NSSIA. 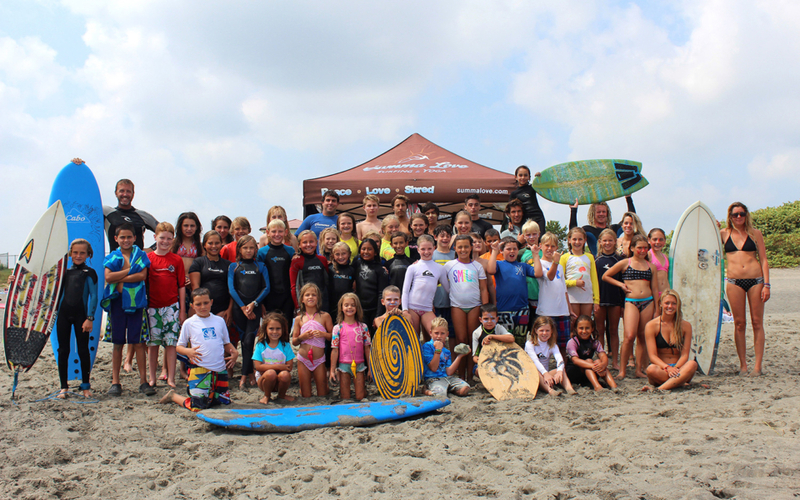 Surf camp starts in June and finishes in September, ages 6 – 17. 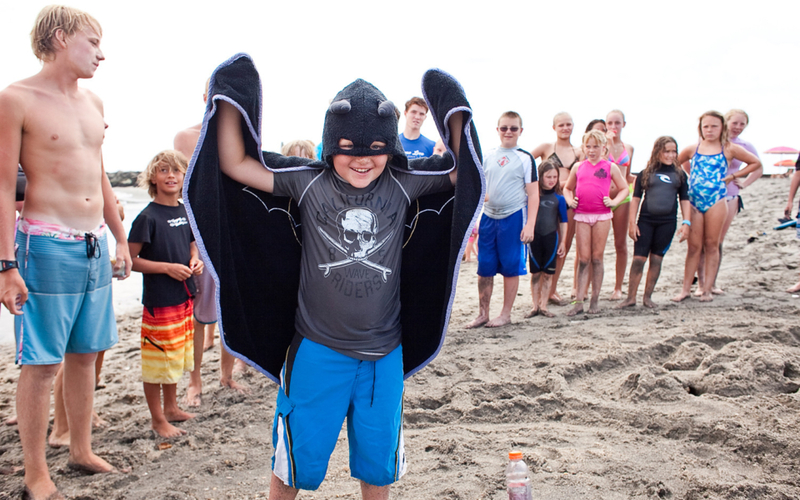 All students must know how to swim in order to enroll in surf camp. Our camps are geared to all levels, with small groups per instructor based on age, ability and experience. Our ratios are 2-3 students per instructor with about 2.5-3 hours of actual surfing time each day (majority of the summer). If conditions are rough, the ratios are 1 to 1 student per instructor for added safety with rotating campers. Ratios for campers with years of surf camp and surfing experience may be 4 students per instructor. 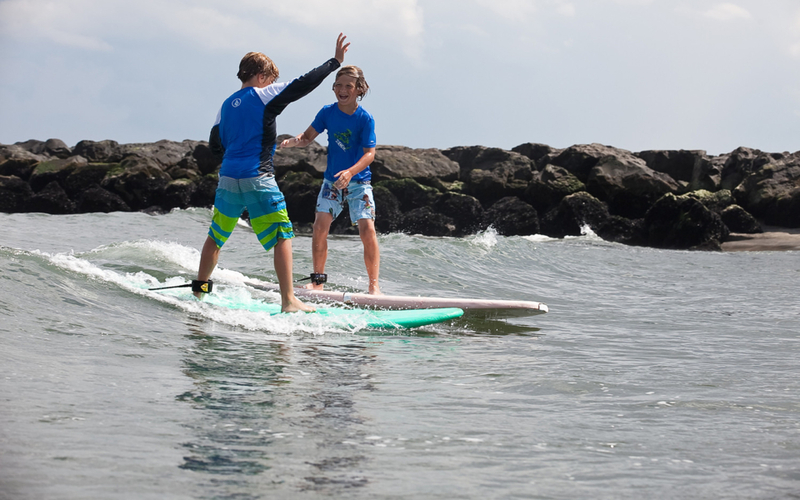 Summa Love instructors will teach the students balance with stable body placement on a surfboard, paddling, duck dives, turtle rolls, standing, etiquette, open ocean safety, safe ways to fall and riding a wave. Each day students will progress at their own level in a fun, safe and low pressured learning to surf atmosphere. 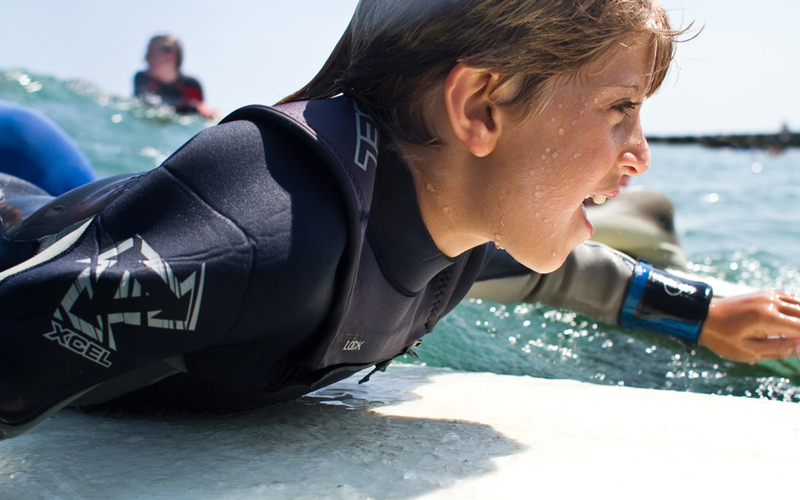 With proper instruction from our teachers, students will gain confidence and learn the fundamentals of surfing at a rapid pace! And most importantly, safely while doing so. Experienced CPR certified professional rescuers accompany the students in the ocean at all times keeping an eye for safety and mistakes. We also teach students with more experience different maneuvers including duck dives, bottom turns, cut backs, floaters and other advanced techniques on a surfboard. Snacks, extra water and extra sun block are supplied as well as 1 day pizza beach party on Fridays, surfboards, yoga (Mondays and Fridays), Stand Up Paddle (if conditions allow), rash guards and wetsuits. Weekly sign ups receive a gift bag with T-shirt, stickers, necklace, wrist band and also a high res photo of them surfing on our website with free download included in tuition. Students are expected to bring warm dry clothes, extra water, lunch Monday – Thursday, dry towel, extra sun block, sandals, bathing suit and rashguard if they have their own (camp supplies rash guards as well). 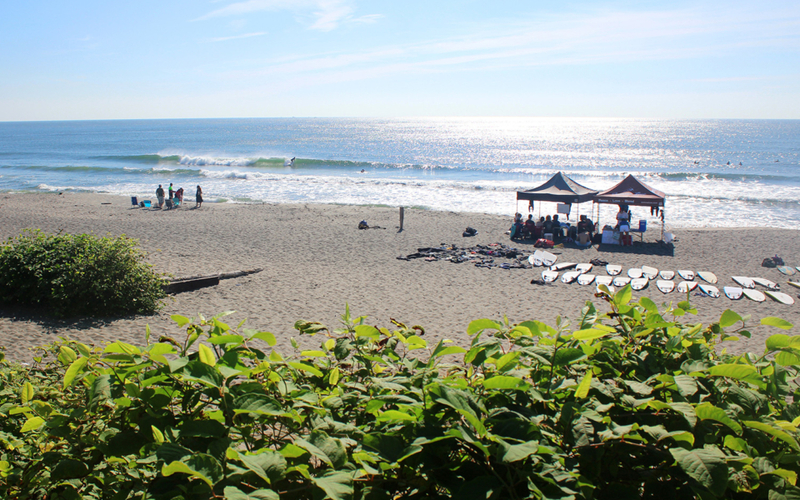 Surf Camp days are for 4 hours during the lower tides for the best surfing conditions. 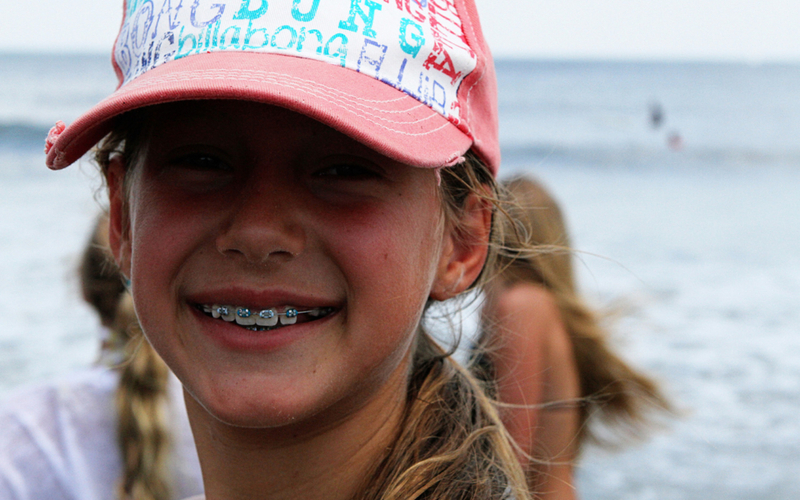 Students signed up for the week must consecutively come to camp Monday – Friday. All camp days and makeups must be scheduled in advance with at least 48 hour notice. We ask for reserving camp dates in advance with no guarantee for inclusion with walk ons. Makeups can be used on designated weekends or up until the end of the season if space is available. Every Spring and Fall, Summa Love has an after school program. 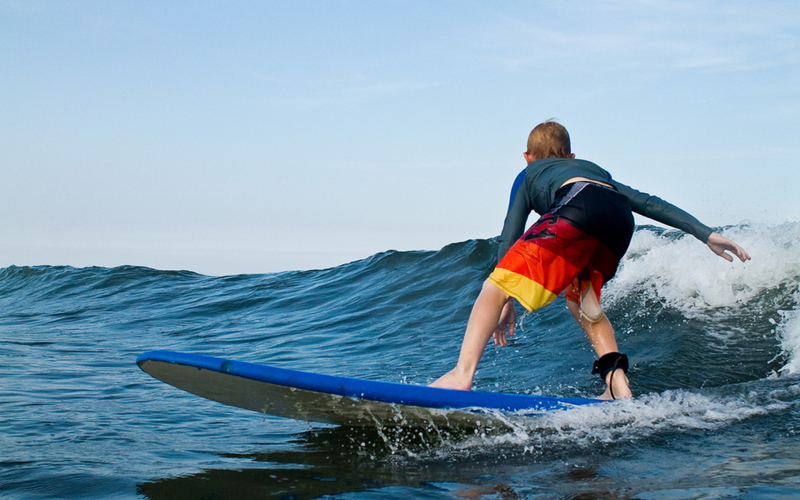 We also offer private surf lessons. Please check out our rates/packages page for pricing details. 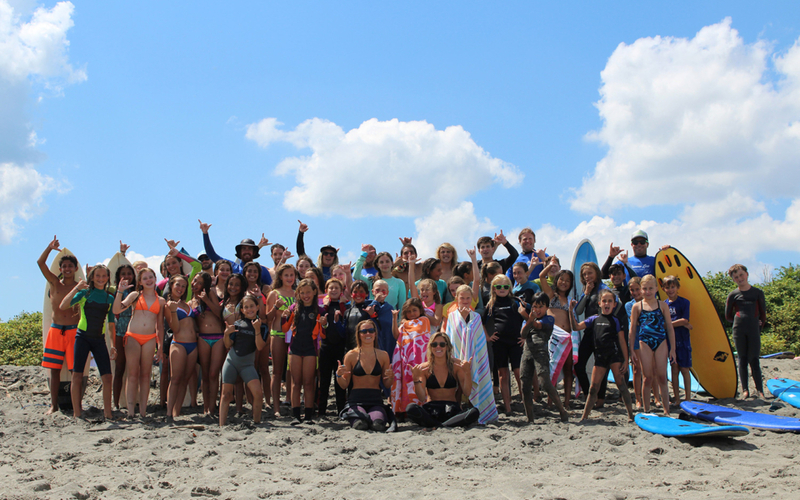 We pride ourselves on being the longest running, safest and most established surf camps in our area with a proven track record for excellent service and a passion for teaching what we love. PEACE, LOVE & SHRED since 2005. Check in, walk to tent and apply sunscreen. Form circle for yoga/stretch, rash guards are handed out and beach talk with campers. Form groups of 2-3 students with instructor. Surf for 1 hour. Total time will be 1 1/2 hours with yoga/stretch and set up. Take 1st break. Campers and instructors eat, hydrate and relax under tents for 30 min. Beach game with campers for 30 min. This equals 2 1/2 hours. Return rash guards, check out and stay with instructors until pick up. Students can bring lunch money to walk to Pier Village with an instructor during lunch break (M-Th) or bring bagged lunch. Yoga and pizza are included every Friday. Stand Up Paddle is included only if conditions permit. Showers and bathrooms are conveniently located at beach entrance. Art class on the beach is included with camp if surfing is either delayed due to rough conditions or we have 1 to 1 student to instructor ratios with rough conditions for surfing. Art class is an option with beach games or rotating with surfing if waves/rip tides are too strong to surf all at once. Body surfing with hand planters (included) is allowed at our camp beach in front of lifeguard stand with instructors in the water. 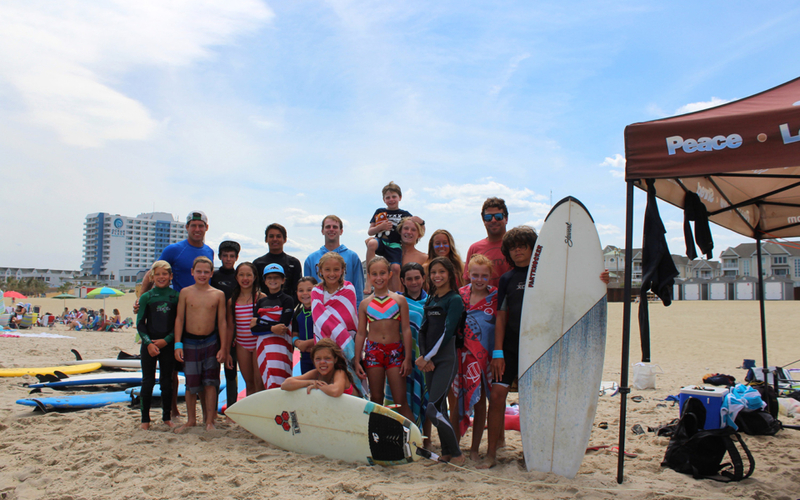 Nationally acclaimed Long Branch town lifeguards are stationed at our camp beach as well as Summa Love qualified instructors in the water with campers for extra safety reinforcements. Water, snacks, equipment and extra sun block are included in camp tuition. Gift bags are included for all weekly sign ups. Free parking on Madison Ave and surrounding streets. Paid parking on ocean front. If no spots are available, drop off and pick ups are at the last left off Madison Ave before beach at the shuttle stop. Students bring a bagged lunch Monday-Thursday. Yoga is included every Friday. Bathrooms can be accessed with a short walk with instructor to Connover Pavillion. No swimming in Deal. Campers can enter ocean with floating device and instructor. Kosher pizza party every Friday is included. Beach staff with eyes on the campers and surf instructors in the water with the campers at all times for added safety with low ratios. Confidence, Self Esteem, New Friends/Connections, Environmental Knowledge, Surf Culture Experience, Physical Fitness, Yoga Experience, Development of Personal Identity, Sense of Competence, Stand Up Paddle board Experience, Self Exploration, Lifeguard Training Experience, Open Ocean Safety Experience, Moral and Social Abilities, Teamwork, Dedication, Compassion and Integrity. If we have to cancel camp due to poor weather conditions you will be able to have a make up day to use during the camp season. If waves are too big to run surf camp instructors will make a collective decision about canceling camp. If thunder storms hit during surf camp, we evacuate the beach immediately and put all campers in the safety of staff automobiles until the storm passes. If conditions are safe we will resume surfing. If we have to cancel we will either extend camp the next day or issue half day credit for campers to use during a future camp date.